This weekend, some 30,000 souls will cross the Cooper River by foot on the Ravenel Bridge, the third bridge used in the last 38 years for the annual 10K Cooper River Bridge Run. 2005 was the last year the “new” bridge (Silas N. Pearman) was used, and Oprah Winfrey was among those who ran the largest bridge run to date in 1994, when the race last crossed the “old” bridge (John P. Grace Memorial). To some of us, it feels like just yesterday that we were driving--perhaps white-knuckled--across the old bridge...now might be a good time to remember its beginnings. Charleston in the 1920s was poised for a renaissance. For decades after the Civil War the city remained in decay and depression, but recent industry and progressive thinking promised the rise of a new, modernized Charleston. According to The Great Cooper River Bridge, by Jason Annan and Pamela Gabriel, the bridge was a symbol of this progress; city leaders projected all of their hopes of the future onto the bridge, regarded as the impetus for unparalleled growth and opportunity. John Patrick Grace, whose name would be memorialized with the bridge, said, “I took the dreams, my own and the dreams of others, and gave them a local habitation and a name ‘The Cooper River Bridge.’” While Grace did become a driving force behind the construction of the bridge, he actually came late to the table. The complete history of the bridge begins much earlier, and it starts at the beach. During the 19th century, Sullivan’s Island succeeded as a defender of the Charleston Harbor, and it served as a summer retreat for affluent Charlestonians. However, the island to its north, across treacherous Breach Inlet, remained a tropical wilderness in isolation. In 1898, the man who introduced the electric trolley to Charleston, Dr. Joseph S. Lawrence, bought the island with a plan to develop it as a resort. Lawrence envisioned an affordable beachfront resort for Charleston’s growing middle class, a playground similar to Coney Island or Atlantic City. The first thing he did was change the name from Long Island (named for its shape) to the more welcoming and exotic-sounding Isle of Palms. Then he devised the necessary transportation to the remote island: he bought ferries to cross the Cooper from Charleston to Mt. Pleasant, laid trolley tracks down Pitt Street through the Old Village, built a low-trestle bridge over Cove Inlet to Sullivan’s Island, laid tracks across Sullivan’s Island (the numbered stations on Sullivan’s Island indicate the old trolley stops) and built the final trestle bridge across Breach Inlet to Isle of Palms. The trip took about an hour and a roundtrip ticket cost a quarter. The resort included a grand hotel, restaurants, bathhouses, dance and music pavilions, a gigantic ferris wheel, steeplechase rides, and a zoo. How much fun! When Lawrence’s ill health forced him to resign in 1913, James Sottile’s Isle of Palms Traction company bought him out. His was the large Sicilian family that had already made quite a fortune in the amusement industry with several movie theaters in Charleston. Sottile continued to market the resort, which had more and more visitors coming from further and further away. In 1913, he was the first to propose a bridge across the Cooper as a faster and more efficient means to bring visitors to ‘Parm’ Isle. His idea of building a bridge for the railroad with lift spans--sections that could be raised and lowered horizontally to accommodate shipping--was quickly squashed. 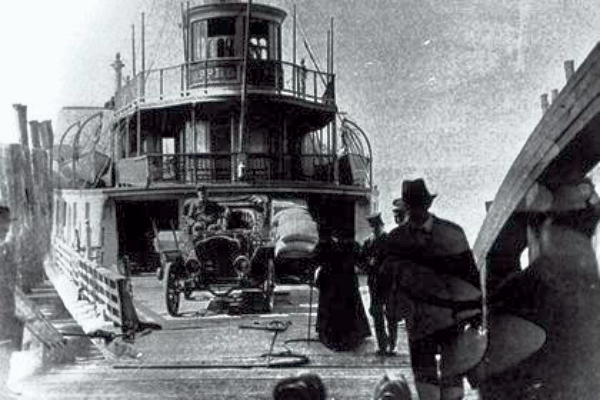 Ten years later, Sottile was bankrupted and his ferry boats were seized by the sheriff in 1924. Charleston had no ferry service across the harbor for the first time in 150 years, until a government-sponsored ferry service was created a year later. The loss stung. 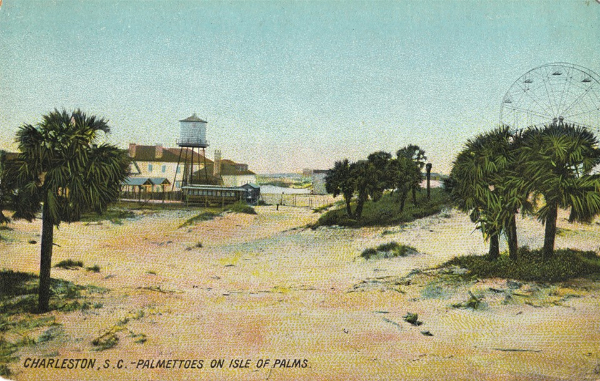 A group of investors bought the Isle of Palms in 1925, in shambles since Sottile’s bankruptcy. They reasoned that a toll bridge across the river would not only be lucrative in and of itself, but along with the newly constructed automobile bridges across Shem Creek and Cove Inlet, it would allow unhindered access to their resort island. Their grand plan for the most popular resort on the coast could be realized, but only with that bridge. 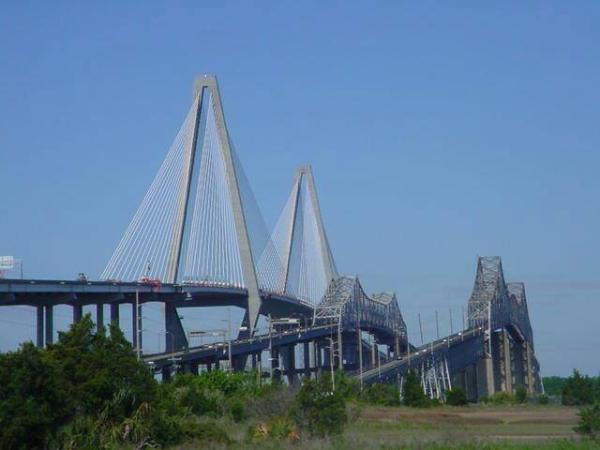 The Cooper River Bridge Corporation was chartered in 1926 by the owners of the Isle of Palms. While some citizens, including Charleston Mayor Thomas Stoney, feared a bridge would mar the Charleston skyline, many recognized a real need. 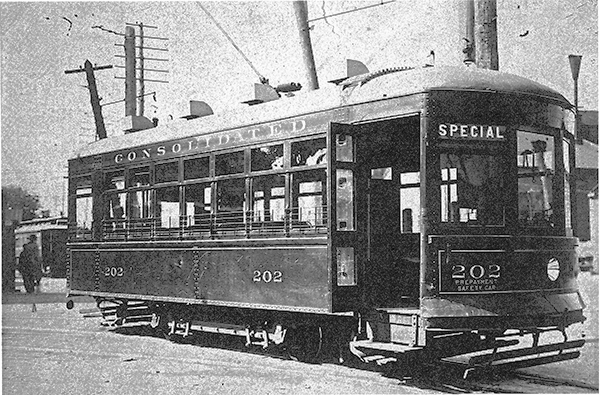 The first model drafted was much like the one Sottile had proposed, except it was designed for cars instead of a railroad. The same objections from the shipping industry were raised, so the next plan actually called for a tunnel-bridge combination--to start at the Charleston waterfront, go under the shipping channel, emerge at Castle Pinckney and then continue over the water to what is now Patriot’s Point. Can you imagine? Turns out, it was cost-prohibitive. Eventually, all parties agreed that a high-level bridge was the only way to accommodate the shipping needs of Charleston. Original plans had the bridge coming into Charleston at the Market; this plan had strong public support and city hall backing. Two approach ramps were designed to start at Meeting Street and run along either side of Market Street; at Church Street the two ramps would join into a single raised roadway over the market, passing beside the Customs House. 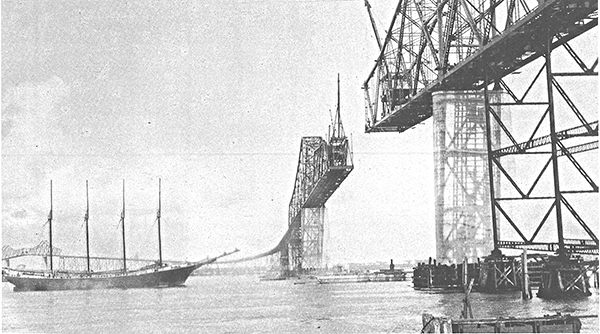 The Charleston Port Utilities objected that having a bridge constructed at the mouth of the harbor would put the port at a major disadvantage. The builders balked at the idea of having the bridge come in a mile up the peninsula since they believed that tourists would not go the extra distance to visit the business and tourism districts. In the end, the double cantilevered-truss bridge entered Charleston at Lee Street after 17 months of construction at the cost of $6 million. On opening day, approximately 11,000 automobiles crossed the bridge during the initial four-hour toll-free period. More followed, paying the tolls that were in line with fees charged by the Cooper River ferries: fifty cents per car and driver, plus fifteen cents per additional passenger. It’s hard to think of bridges being privately owned these days, but the Cooper River Bridge was built by private investors to make money. And at the close of the Roaring Twenties, no one doubted that it would. But within only six weeks of its opening, the Cooper River Bridge was in danger of being auctioned for delinquent county taxes. Investors initially bailed it out, but the finances never got any better. The Great Depression settled in. No big manufacturing plants moved to Charleston and there was no massive development East of the Cooper. There were no investors rushing to buy up property on the Isle of Palms and no wealthy tourists. The Cooper River Bridge was not bustling with traffic; it was a bust. In 1936, the Cooper River Bridge Corporation declared bankruptcy. 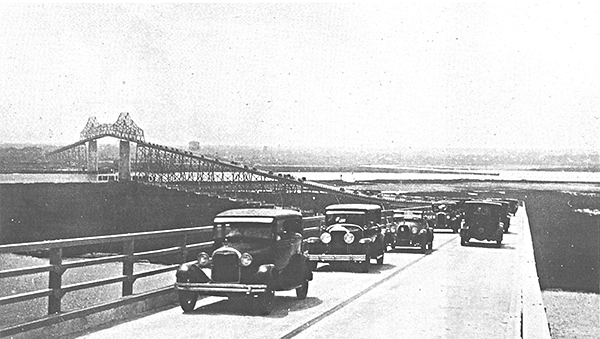 In the early 1930s, state transportation officials began discussing the idea of buying the Cooper River Bridge. But the discussions turned to debates and became a political mess. Locals were frustrated with the tolls, regarding them as a hindrance to economic development and tourism as well as regional growth. 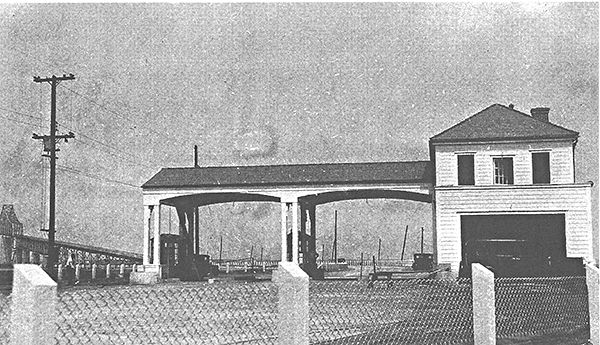 In 1933, Mayor Maybank said, “The entire future of Charleston absolutely depends upon the Cooper River Bridge being made free...if we are to survive as a tourist town this bridge must be free.” The county bought the bridge in 1941 and throughout World War II, continued to operate it as a toll bridge. In 1945, the state highway department bought the bridge from the county and it became ‘free of toll’ the next year, to much fanfare, including a wrestling match and fish fry. Indeed, the 1950s saw Mt. Pleasant grow from a sleepy farming village to a middle-class suburb. The 1960 census showed that its population had increased nearly 200% since 1940. And see what’s going on over there now? Although John P. Grace died in 1940 before his 1929 dreams of Cooper River Bridge-driven growth and prosperity were realized, the bridge was officially renamed the John Patrick Grace Memorial Bridge in 1943. The old bridge was two-way until the new bridge opened in 1966; both were removed in 2005.